December 20, 2008 by Alphageek in "alphageek vt virginia tech md maryland football thursday night"
This is one of my favorite pictures. 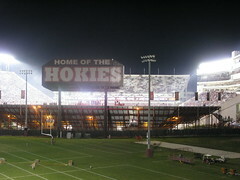 This is the view from Cassell Coliseum of the football stadium. This picture was taken before the Maryland Thursday night game. I was able to open a window, prop my camera on a cup, and take this picture. I am very pleased with the results, which is why I am sharing it with you. Like I said, a very short post. "alphageek vt virginia tech md maryland football thursday night"